In therapy, the term “family of origin” refers to the caretakers and siblings you grow up with, your first ever social group. 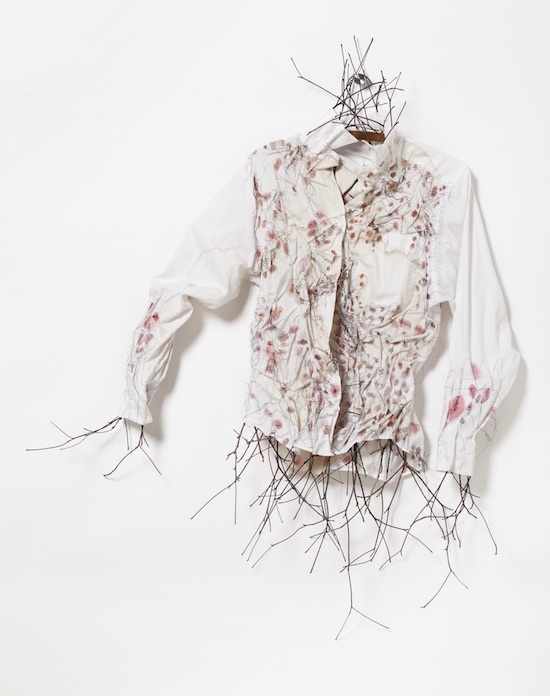 In Merill Comeau’s upcoming show at the Chandler Gallery, the term, like the material she works with, is deconstructed and reimagined. Each piece is a representation of different familial experiences, and how those experiences intersect with one’s sense of identity and community. 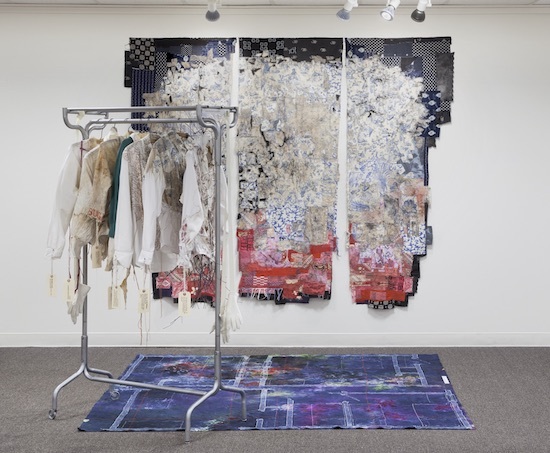 The installations, murals, and garments of Comeau’s show all have their own origins too: some with personal meaning, like her late mother’s blouses, others from vintage linens and miscellaneous re-purposed material, like the floor plan of a child’s bedroom. Clothing and fabric are distinctly human and, as Comeau noted, they are often used to mark life’s passages and rituals. These purposes are in mind as they are juxtaposed to “tell tales of our shared human experience. 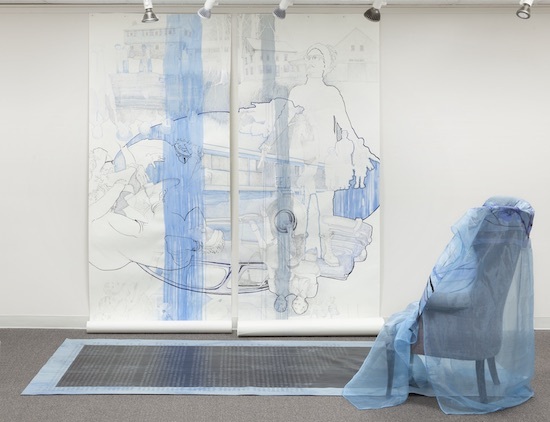 While she derives some inspiration from feminist artists like Judy Chicago and Miriam Schapiro, Comeau also felt inspired in her work with the Massachusetts Department of Youth Services. There, she teaches art to students who are 14 to 22 years old, serving sentences in secure treatment facilities. “Frequently, they have experienced trauma within their ‘families of origin’ and often do not identify with society’s idealized image of well-functioning ‘normal’ family,” she said. “I share a similar feeling. 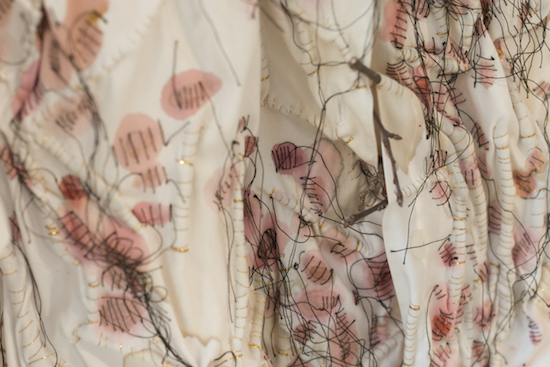 Her art, she explained, is a way of processing that trauma by performing tasks such as seam ripping, laundering, ironing and stitching. She both literally and figuratively mends and repairs, what she called “an act of exorcising memory and building hope.” Even when life is seemingly in tatters, there is something to be built from it. “Family of Origin” is on display at the Chandler Gallery from July 9-August 3. The opening reception will be held on July 12, 6-8 p.m. The Chandler Gallery is a program under the umbrella of the Agassiz Baldwin Community, a private, non-profit organization that has provided quality programs and services in the Cambridge community for over 40 years. Agassiz Baldwin Community also manages Maud Morgan Arts, a full arts program of classes and workshops for all ages. Maud Morgan Arts works to reflect the diversity of talents of the community, bringing people together to make art, share art, and support visual arts education.